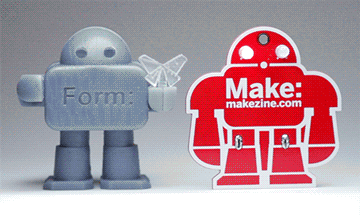 The Formlabs team will be descending on the World Maker Faire NYC on September 21 and 22! C'mon down to see the Form 1 in action. We'll also be showing off our newest and snazziest prints, working machines, giving run-throughs of our PreForm software, and much else besides. We'll also be giving you sneak peeks at some of our latest software features (take a close look at the supports we've got there), as well as featuring some of he spectacular modeling work of Robert Vignone. And the little guy up top &ndash; ? We've been working on making lightpipes with our Clear resin. We can't wait to show them off. Stay tuned for more updates, and let us know if you're planning on coming by!